Rachel graduated from Nottingam University Medical School in 1994. She trained in clinical paediatrics in Nottingham, London and the South Western Deanery and she completed subspecialty training in Paediatric Nephrology in Bristol. She was awarded a Wellcome Trust Research Training Fellowship in 2004 and completed her PhD focusing on glomerular cell biology in 2007. 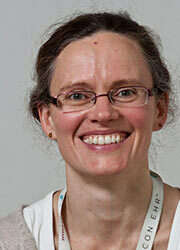 She was appointed to a NIHR clinical lectureship in 2007 and commenced a Wellcome Trust Intermediate Clinical Fellowship at the University of Manchester in 2010. In the fellowship, Rachel combines clinical duties at the Children’s hospital with laboratory-based research. Her research team is based at the Wellcome Trust Centre for Cell-Matrix Research and her research programme involves the application of global analyses to build understanding about cell-cell and cell-matrix adhesion in the glomerulus. The goal of this research is to identify new targets for therapeutic intervention for patients with glomerular disease.